Americans LOVE pizza. Whether crispy thin or chewy thick crust, spicy tomato sauce or zesty pesto, traditional mozzarella or trendy bleu cheese, pizza is a treat we all want at least once in awhile. It presents a special challenge to people who need to avoid gluten because the typical crust is, well…mostly wheat. There are people who eat to live, and there are people who live to eat. I am one of the later, and I surround myself with friends who adore all things eaten as much as I do. Several of these friends are among the many people who have found themselves allergic or otherwise reactive to gluten, and one in particular found she couldn’t live without pizza. Her search for tasty gluten-free crust led her and her husband to consume many sub-optimal pizzas before she finally morphed about six recipes into what she defines as the perfect gluten-free crust. By her report, this crust is crispy on the bottom, chewy in the middle, and even tastes great either rewarmed or straight from the refrigerator if by some miracle there are leftovers. I haven’t tried this yet, but she was so enthusiastic and happy to share her recipe that I am passing it on to all of you. If you make it, please let me know how it goes. Full credit for the recipe and photo goes to my friend Holly Reed. In bowl of electric mixer, whisk together tapioca flour, white rice flour, sorghum flour, xanthan gum, Parmesan cheese, seasonings, and salt. In a small saucepan stir together milk, buttermilk and water. Turn the burner to medium and heat until warm but not hot to the touch, about 1 minute. Do not let this boil!! (the mixture should register between 105°F and 115° F on candy thermometer). Stir in yeast and sugar. Add milk, yeast mixture, egg whites, and oil to dry ingredients and beat at medium speed, scraping bowl occasionally, until dough is very smooth and very thick, about 5 minutes. 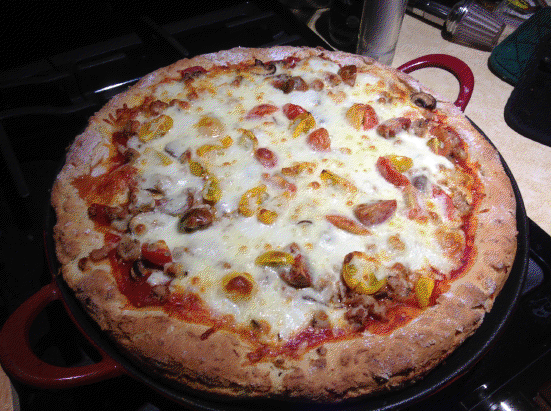 I used a cast iron pizza pan – lightly oiled for a smooth transition off the pan. Spread dough out to edges of pan, leave more dough at edges. This dough is pretty soft – not like a regular bread dough. You will want to oil your hands (palm full of olive oil and rub it around like lotion). I also used more rice and tapioca flour to keep it from sticking. Even with that I had to use the back of my hand to gently spread this out across the pan. Don’t worry that this isn’t like regular dough. It will rise fine and taste great. Place the pan containing the dough on bottom rack in 425 degree oven for 3 min. Take out (do not turn the oven off yet!) and leave on top of oven for 20 min. It should look risen at the edges. Place back on bottom rack in oven for 5 more minutes. Remove from the oven and increase oven temperature to 450. Cover crust with sauce and pre-cooked toppings of your choice (we use chicken sausage, mushrooms, fresh mozzarella, tomatoes, and shredded mozzarella). Place back in oven on the top rack and bake for 18-20 minutes until cheese and crust are browned. If your crust is done but the cheese isn’t you can put this on broil for about 3-5 minutes at the very end. This makes a thin bottomed but thick, chewy, and fluffy crust pizza.